Boreal forests are the northernmost forests in the world. These are vast forests that include 29 percent of all the world's forest area in a belt around the Northern Hemisphere, including Scandinavia, Russia, and Canada. In the United States, boreal forests occur in central Alaska and northeastern Minnesota. Boreal forests are dominated by species of spruce, fir, pine, larch, birch, and aspen. Their forest floors are usually covered with mosses and many species of wildflowers. The distinguishing climatic features are long winters with five to seven months of snow cover and a short cool summer. July mean temperatures fall between 13 and 18 degrees Celsius (55 to 64 degrees Fahrenheit). If summers are cooler than this temperature range, trees are unable to complete their summer growth cycle, and tundra is the dominant vegetation. If summers are warmer, temperate forest trees such as maples and oaks become dominant. Boreal forests can be divided into southern and northern zones. Southern boreal forests have a high density of trees 15 to 30 meters (50 to 100 feet) in height and are productive enough to produce timber and fiber for paper pulp. Those southern boreal forests in the interior of North America and Asia, away from the oceans, periodically experience very large, high-intensity crown fires that range from 40,485 to 404,858 hectares (100,000 to 1 million acres). These forests are composed of species that reproduce well after fires, such as jack pine, aspen, and black spruce. Some southern boreal forests change little in species composition over time, even after fire. For example, central North American jack pine forests on shallow rocky soils burn in high-intensity crown fires and regenerate directly back to jack pine. In other regions, with deeper more fine-textured soils, boreal forests of spruce and fir are replaced by aspen and birch after fire, and the conifers take several decades to regain dominance. 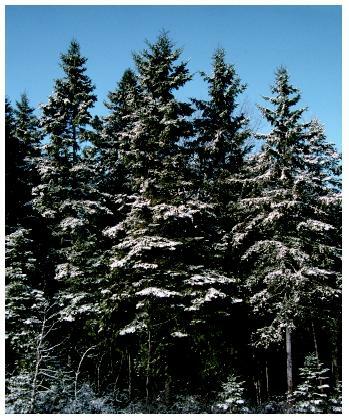 Northern boreal forests occur on permanently frozen ground so that they are stunted (6 to 15 meters [20 to 50 feet] in height), with low tree density. These forests, also called taiga, have thick mats of water-soaked moss and burn infrequently. Boreal forests are dominated by species of spruce, fir, pine, larch, birch, and aspen. Tree and plant species in boreal forests have broader environmental niches than in temperate or tropical forests. For example, black spruce can grow in poorly drained bogs and on well-drained rocky hills. It can reproduce well after major forest fires and in older forests that have not burned for some time. Thus, it is both a lowland and upland species and a pioneer and old-growth species. Characteristic wildlife in the boreal forests includes bear, moose, woodland caribou, wolves, lynx, and wolverine. Deer are restricted to the southern margin of the boreal forest. Many migratory birds use the boreal forest during summer, including warblers, pelicans, seagulls, and hawks. Species of owls and ravens are year-round residents. The North American boreal forest is still mostly primary forest (first growth) but is now being logged for timber and paper pulp. The Russian boreal forest has seen much less logging, but that began to change in the 1990s. Logging often changes dominance of boreal forests from conifers to aspen and birch. Global warming also has the potential to change boreal forests more than most other forest types; the predicted temperature change for the boreal forest is greater in magnitude than for temperate and tropical forests. Larsen, James A. The Boreal Ecosystem. New York: Academic Press, 1980. Olson, Sigurd F. Sigurd F. Olson's Wilderness Days. New York: Alfred A. Knopf, 1972.